July 23, 2015--We drove to Bowling Green, Ky., yesterday. We had thought about touring Mammoth Cave, but when we entered Bowling Green, we were greeted by a billboard advertising the Corvette Assembly Plant and the Corvette Museum. Those would be our tourist destinations, we decided. A couple years ago when we were in South Carolina, we toured the BMW plant; it was fantastic to watch the robots assemble the cars with very little help from human hands. Corvettes are built in a similar manner, although I think BMW has more automation than Chevrolet. It was a good tour. Hand in glove with the tour is the National Corvette Museum. 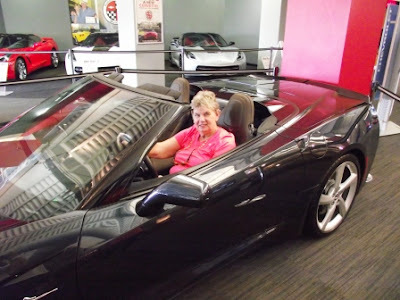 I have to admit that I am not enamored with Corvettes. They are a nice vehicle, obviously. But I wouldn’t buy one even if I had the money. However, we thought it would be fun to look at the evolution of this sports car. Getting into the Corvette was not too hard. Getting out was another story! 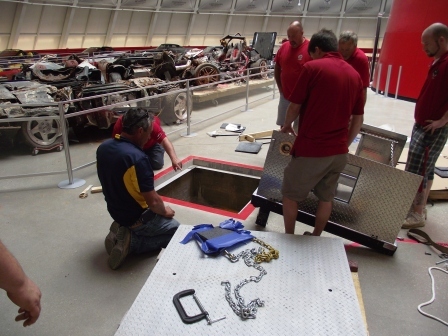 And then we remembered: It was here at the National Corvette Museum that a giant sink hole opened up and literally ate about a dozen irreplaceable cars. That happened in February 2014. It took engineers two months to retrieve the cars. Engineers peer into the 60-foot deep sinkhole that destroyed a significant number of antique Corvettes. The public can look through the plexiglass to see into the cavity. Officials are trying to figure out how to make a marketing opportunity out of the tragedy. They are already succeeding. The sinkhole is the best part of the museum! We actually thought that was the best part of the museum! When you enter the large room where the cars were/are on display, the first thing that catches your eye is the tape on the floor. It shows the outline of the sink hole, as well as the outline of the cave that not resides beneath the showroom. The retrieved cars are on display. They want to restore all of them; however, I believe some are beyond repair. The first car they pulled out of the pit was the last one to drop into the hole, and it was relatively unscathed. The deeper they went, the more damaged the cars (naturally). Some of the retrived Corvettes. Above are some of the last cars to go into the hole. Below, some of the first. Doubtful that they can restore these--or will want to, since it is a museum draw. While we were in the show room, some engineers were looking at the 60-foot deep hole into the cave. The section of flooring they were peering into had a glass window, so that visitors could see the depth of the sink hole. Museum officials have not yet decided what they will do ultimately with the sink hole/cave. In the meantime, they are not forfeiting the opportunity to market the tragedy. In the gift shop (there is always a gift shop at the end of a tour, isn’t there? ), visitors can buy a bottle of the sink-hole debris. We passed on this opportunity. The museum is marketing the tragedy. 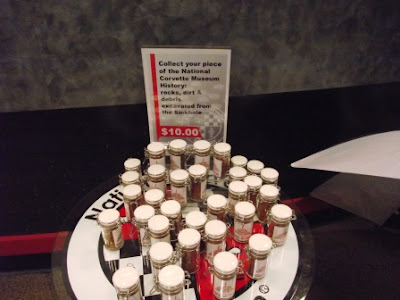 Visitors can buy a small bottle of sinkhole dirt. We passed on the opportunity. It was a good day, which ended with night’s stay in Elizabethtown, Ky.
Back home again in Indiana! Gold in them thar hills! Smile, even if it hurts!